February 14 is celebrated as Valentine’s day every year. It is a day reserved especially for your loved ones and is celebrated all over the world. 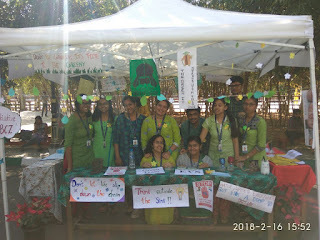 This year’s Valentine’s day though, witnessed a unique event in Christ (Deemed to be University), Bengaluru. 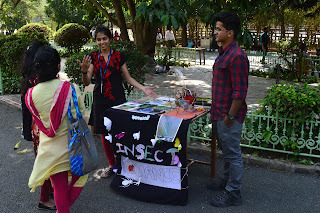 A group of students from an organisation called Green Army put up a Zoology exhibition in the university campus. Do not be fooled by its name though. Surprisingly, the theme of the exhibition was Valentine’s day! Six different tables, dedicated to six different groups of animals explained about the courtship in animals. The exhibition went on from nine in the morning to five ‘o’ clock in the evening. 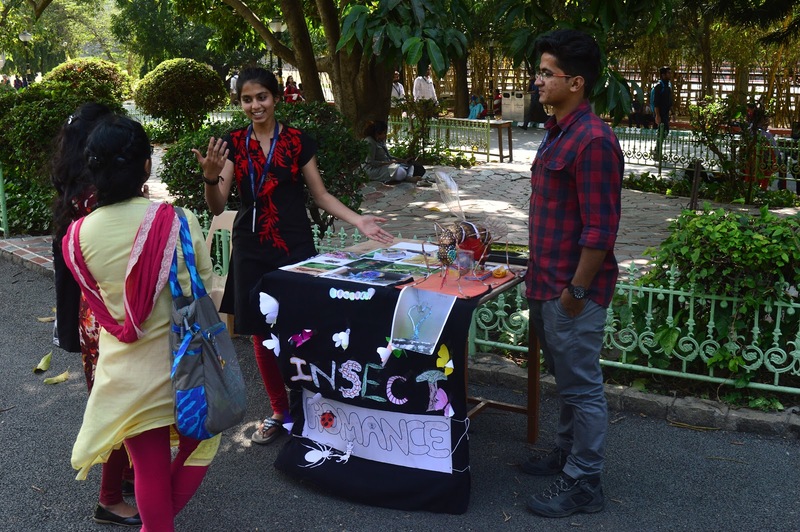 From song birds and colourful dances, to spiders eating up their partners, the vivid pictures, videos and specimens on display kept the audience enthralled. Who knew that there were so many different ways to woo your partner?! The Dance of The Whooping Cranes, The Cannibalistic Praying Mantis, The Dancing frogs and The Garter snake ‘Mating Balls’ were some of the many interesting behaviours to choose from. Along with these, there were additional attractions like snake scale counting and weighing an elephant’s tooth that caught the attention of the passers-by. There were six more tables, with interesting information and facts about the fascinating world of animals. The aim of the program was not only to educate people about animal behaviour but also to spread the message of conservation among them. From tiny insects to huge mammals, the importance of each and every animal group in the ecosystem was explained by the students. 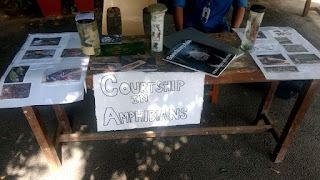 The exhibition was a successful attempt by the members of Green Army, to show the students the beauty and diversity in the animal kingdom and make them aware of how important it is to protect our flora and fauna. It left many people more aware about the world that they share with these wonderful beings, and the importance of conserving our forests, rivers, grasslands and oceans, and the wildlife that lives in it. 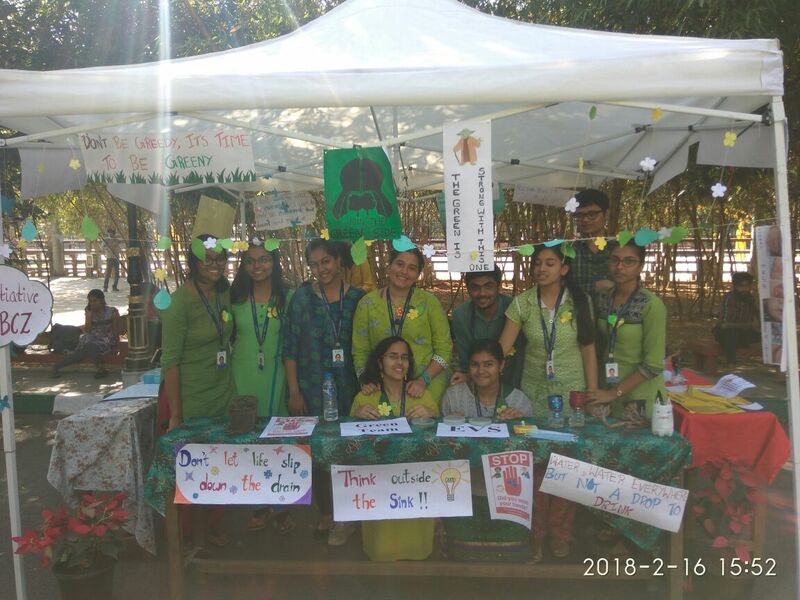 ‘Butterflies of Christ University’, the third book by the Green Army student forum was officially released on 11th of January 2018. 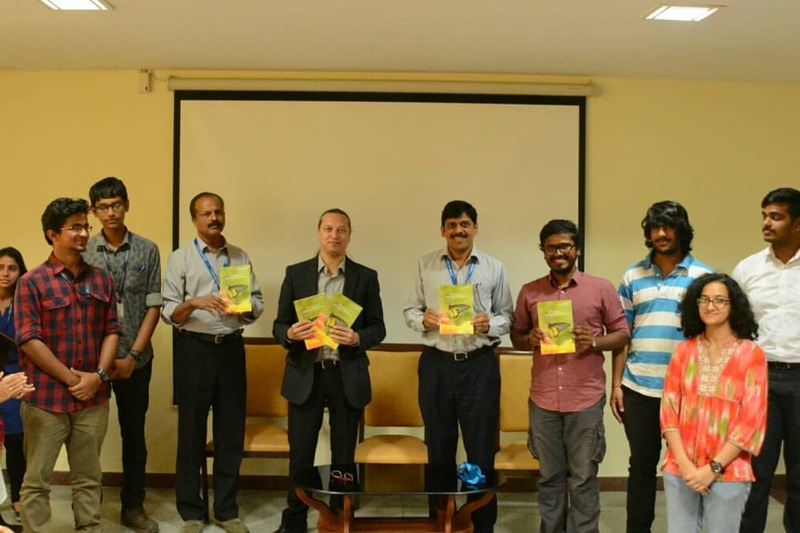 The book release function took place in the Council Room, Christ University, Main Campus. The chief guest of the day was Dr. KrishnameghKunte, Reader, NCBS. The Registrar of Christ University Dr. Anil Pinto was also present for the function. It was a proud moment for the Department of Life Sciences as it successfully published a third pictorial guide of the species in the campus after ‘The Bird Book’ and ‘Guhanagiri’. 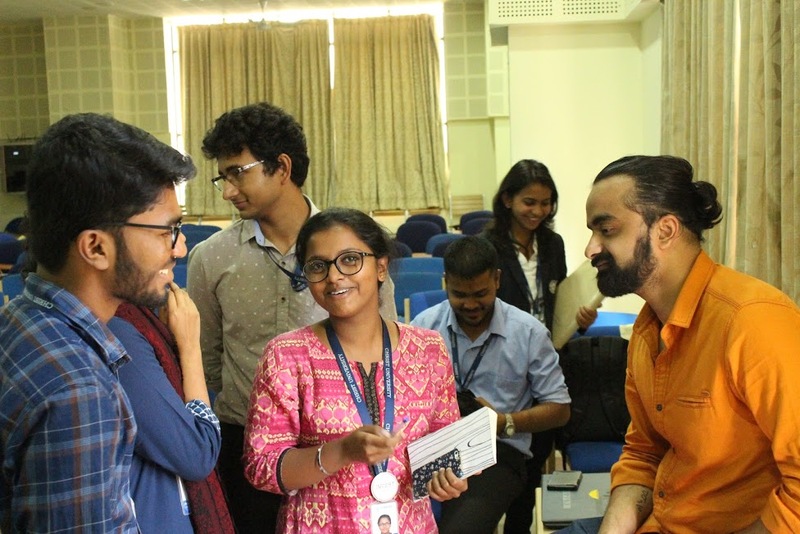 The interactive session with Dr. KrishnameghKunte was highly appreciated by students as it gave them an opportunity to put forward their ideas and obtain deeper knowledge about research through his suggestions and highly qualified work experience. The event ended on a triumphant note under the guidance of Dr P U Antony. The Life Science Association organized a guest lecture on Demise of Arctic Sea Ice by Dr Vishnu Nandan, University of Calgary, Canada. Dr Vishnu had done his research in the area of remote sensing in measuring Arctic sea ice. He was the lead author of a research article which was published in Geophysical Letters, October 2017 issue, which emphasised the role of salt in sea ice which interfered with the measurement of polar sea ice depths by satellites. He was also featured in the February issue of Frontline magazine.During the session, he talked in detail about the techniques involved in measuring sea ice thickness and also elaborated on the effects of dwindling sea ice on the Arctic ecosystem. Dr Nandan also gave another lecture on the topic “Potential Research and Career Opportunities in the area of Climate Change Studies and Cryogeography to the MSc students of Biotechnology, Botany and Zoology. The students were very enthusiastic hearing the lecture and asked a multitude of doubts after both the sessions to which Dr Nandan replied patiently and in detail. The session was attended by students of BSc and MSc Life Sciences and also few faculty from Life Sciences, Chemistry and Computer Science. On 5 January, 2018, a talk was organized by the Life Science Association for the postgraduate students of Life Sciences, on the topic “Microtubules in cell migration”. The talk was given by Ms. Shailaja Seetharaman of Pasteur Institute, Paris, formerly a student of Christ. With a brief introduction on Cell Migration and Cytoskeletal structures, the talk was directed towards the role of this very phenomenon in Cancer cells. Just like a cell cannot move without a stimulus, it cannot attach to the extracellular matrix without focal adhesions. Thus these focal adhesions were highlighted to play a major role in cell adhesion. The talk then went on revolve around tubulin-acetylation and its effect on focal adhesion turn-over and dynamics.Before the end of the talk, Ms. Seetharaman brought to our notice the various criteria to be checked while presenting research data in the form of figures. The students thoroughly benefitted from the interaction.